“If equal opportunity in America were an accomplished fact, then a chronically bad economy would be equally bad for everyone,” Romney told the nation’s leading civil rights group at their national convention in Houston, Texas. “Instead, it’s worse for African-Americans in almost every way. The unemployment rate, the duration of unemployment, average income and median family wealth are all worse for the black community." 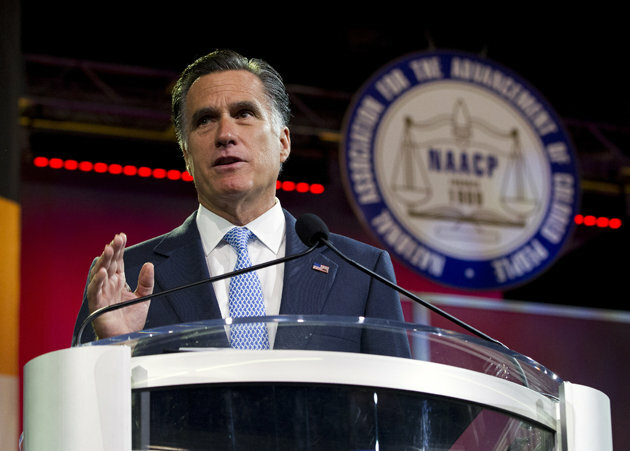 While Obama carried the black vote in a landslide in 2008 and leads Romney 92 percent to 2 among black voters, according to a Quinnipiac University poll released on Wednesday, Romney hopes his economic pitch will resonate with a group that has been disproportionately affected by the economic downturn. He's made a similar appeal to other voting blocs, such as Hispanics and women. Romney earned mild applause during his speech but spoke to a seemingly skeptical crowd. He earned the loudest response — widespread “boos” — when he referred to his pledge to repeal “Obamacare,” the president’s healthcare reform legislation. But Romney, who paused to let the crowd respond, deviated from his prepared remarks to double-down on his pledge. “I say again, if our priority is jobs, and that’s my priority, that’s something I’d change,” Romney said, referring to a study indicating that the healthcare law makes employers less likely to hire.